“Books are the windows to the wide world around you”, reads the large black lettering on the library wall at Okemos Public Montessori (OPM). 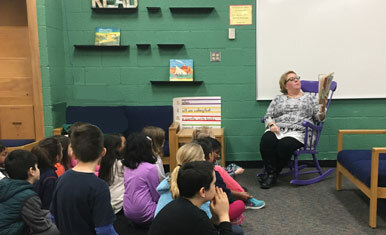 Librarian Sally Langley has flung open those windows and is taking students on a journey around the world. For the 2017-2018 school year, all OPM students are traveling, via literature, to countries around the globe. Travelers diligently keep track of where they’ve been and where they’re going on a large map of the world prominently posted outside of the library. Small flags mark their destinations while a string zigzags across the map marking their progress. The itinerary includes stops in Paris, Kenya, Tanzania, Egypt, Germany and Italy. As world travelers, they learn some basic words in the local language prior to visiting a country such as, ‘hello’, ‘good-bye’, ‘mom’, and ‘dad’. Many OPM students have roots in these countries and are excited to travel to places that are familiar. This provides students an opportunity to take pride in and share their culture and heritage. Indeed, some are even able to offer assistance with the proper pronunciation of words. Stories range from fairy tales to folk stories to biographies. The subject matter is sometimes far removed from anything these students have ever encountered. In the Kenyan story, Beatrice’s Goat, the protagonist desperately wants to go to school but cannot because her family is too poor. On their visit to Tanzania, students met a young girl who was suddenly charged with caring for her baby brother because her mother had died. These glimpses into the radically different lives of children around the globe helps students appreciate that there is a whole world out there. This encourages students to understand themselves within the context of that larger world. 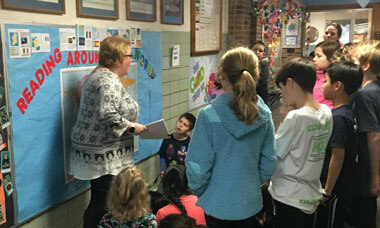 One student remarked that this project has made her realize just how fortunate she is and has prompted her to think about ways to help children in other parts of the world. 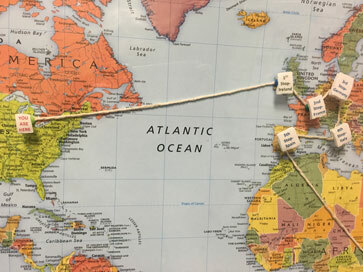 Traveling the world via literature enables students to imaginatively experience other worlds and to see differences, diversity, and possibilities. Yet beneath these real and important differences, these stories also develop timeless and universal themes. These are stories of hardship, of courage, of being different, and of overcoming fears. By traveling the world through books, students are given an opportunity to reflect on both the diversity and the unity of human experiences. Mrs. Sally is extremely grateful for the OEF grant money used to purchase the books for this project. The students are grateful, too, judging by their enthusiasm. 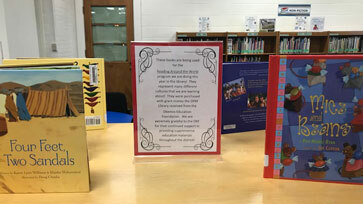 These books will remain in the OPM library collection so students can pick up a book and travel the world for years to come. Learn about other OEF grant programs. Learn about OEF sponsorship opportunities.